A movement without memory is adrift. And a movement that picks the wrong heroes is lost. Two milestones should serve as reminders to self-styled members of the Resistance. One marks a turning point in the life of an ill-chosen hero. The other is a reminder that true heroism calls for self-awareness, self-confidence, and self-sacrifice. We’ll get to those milestones. But first there’s the matter of torture. Donald Trump has nominated Gina Haspel to run the Central Intelligence Agency. Haspel, a career intelligence operative, led torture operations and ran a CIA “black site” in Thailand which was used to interrogate suspected Al Quaeda members after 9/11. She also signed the order to destroy the videotaped evidence of the agency’s illegal acts, which itself appears to have been illegal. Haspel was apparently present for the torture of a detainee named Abd al-Rahim al-Nashiri, (It was incorrectly reported that she was also present for the torture of Abu Zubaydah, a more famous prisoner.) There have even been calls for Haspel’s arrest. Sen. Dianne Feinstein, a member of the Senate Select Committee on Intelligence, notes that Haspel “was involved in one of the darkest chapters in American history’ and has called on the CIA to declassify documents regarding her role in overseeing torture. Brennan’s tweet was widely praised by some liberals, presumably including many who were appalled by Haspel’s nomination. But Brennan, who replaced Haspel as head of the CIA’s clandestine division, defended the CIA’s use of torture in 2013. He agreed that some agents had gone too far, but disagreed with the Senate Intelligence Committee’s conclusion, backed by other experts, that torture had not yielded “useful” information. A year later, the CIA’s inspector general confirmed that the agency had spied on the Senate Intelligence Committee itself. The CIA then attempted to elide its own guilt in the matter, drawing Feinstein’s ire. But even when taken at face value, the inspector general’s report showed that the CIA acted in defiance of the principle that intelligence and law enforcement agencies should be subject to democratic, civilian oversight. And who was the CIA’s director when it spied on that “over the top” Senate committee? Among Democrats, James Comey has gone from hero to villain and back so many times that it’s hard to keep track. He was a hero to Democrats when Obama appointed him to lead the FBI in 2013, because he had blocked George W. Bush’s attempt to get then-Attorney General James Ashcroft to reauthorize a domestic spying program while he was in a hospital intensive care unit. Comey became a villain to Democrats when, as FBI Director, he spoke publicly about the FBI’s investigation of Hillary Clinton’s email servers shortly before the election. But he became a hero again when he defied Trump over the Russia investigation, an act that led to his firing. Trump’s attack on Comey’s character have made his upcoming book a bestseller. That, too, is a sign of liberal enthusiasm. Mueller is coming Lady Justice is coming with him. I Salute the Men and Women of the FBI! I Salute the Men and Women of Muellers Team. I Salute all those People Defending America! IC, CIA, NSA, Police, Firemen, Teachers, Drs and Nurses. I Salute You! For America! These commenters may not know that Mueller was criticized for supporting the rush to war in Iraq by stating, incorrectly, that Iraq had weapons of mass destruction. He was challenged in 2003 by whistleblowing special agent Colleen Rowley for implying a link between Iraq and Al Qaeda, and for reportedly allowing the FBI to state incorrectly that there were 5,000 Al Qaeda terrorists in the US. The FBI’s moves against peaceful protestors did not die with Dr. King. After filing a Freedom of Information Act (FOIA) request, the ACLU revealed that the FBI spied on anti-Iraq war protestors, including Quakers and student groups, during George W. Bush’s presidency. Documents obtained by DBA Press and the Center for Media and Democracy showed that the FBI misused a counter-terrorism program known as “Operation Tripwire” to spy on peaceful Occupy protestors, in concert with private-sector informants. The Partnership for Civil Justice Fund obtained documents showing that the FBI was coordinating nationwide efforts against the Occupy movement as early as August 2011, before the occupation of Zuccotti Park in New York City. The FBI Director who oversaw all of these these covert programs was Robert Mueller. Then there’s James Clapper, the former Director of National Intelligence, who’s also being celebrated for his attacks on Trump. Since retiring in January, Clapper has taken the lead in alleging that Russia aided Trump – a right-wing president – get elected. He has also used these allegations to stigmatize and demonize the Left. And yet, Clapper’s report on Russian spying – a report which inexplicably placed much of the blame for the election of a right-wing president on left-wing websites – was treated as gospel by many Democrats and liberals. We promised two milestones. Here’s the first. On March 12, the five-year statute of limitations ran out on Clapper’s Senate lie. He can no longer be prosecuted for perjury. That’s good news for Clapper, but bad news for the rule of law. Donald Trump is both corrupt and unstable. I share the hope Mueller succeeds in bringing him to justice, although a President Pence could conceivably do more legislative damage than Trump has done thus far. Trump’s escalating war of words against Mueller, even as his lawyer argues that Mueller’s investigation should be shut down, is deeply worrisome. But the Democrats who idealize figures like Mueller, Clapper, Brennan, and the others are sacrificing the long-term needs of justice – the “moral arc of the universe” that Dr. King talked about – for short-term expediency. Some of the people currently being lionized, like Comey, probably acted according to their own moral lights. But theirs aren’t necessarily the morals this country needs. It’s possible to hope they succeed without turning them into heroes. Choosing the wrong heroes only makes it easier to be misled into another war, or more torture, or another campaign of illegal spying. “At this point, I am not,” Schumer replied. Sen. Feinstein also seems to be equivocating on the Haspel nomination. Meanwhile, the New York Times reports that the White House is using intelligence channels, rather than the State Department, to communicate with North Korea. We tell the stories of heroes so that we can remember. But when we choose the wrong heroes, we forget. Here’s the other milestone we mentioned: March 16, 2018 marked the 50th anniversary of the massacre of Vietnamese civilians by US troops in the village of My Lai. In Vietnam, the CIA was leading the Phoenix program, which engaged in kidnapping, torture, and murder. CIA Director William Colby told a Congressional subcommittee that the program killed 20,587 people. But when the My Lai massacre was underway, someone resisted. Hugh Thompson, Jr. was piloting an observation helicopter. He and his crew saw dead bodies around the village, but had encountered no hostile fire and had seen no sign of Viet Cong combatants. Thompson reported the massacre, and later testified about it on Capitol Hill. It took years for Thompson to be recognized for his actions, but he and his crew received the Soldier’s Medal for bravery in 1998, thirty years after the massacre. “Self-trust is the essence of heroism,” said Ralph Waldo Emerson. Hugh Thompson, Jr. died in 2006. 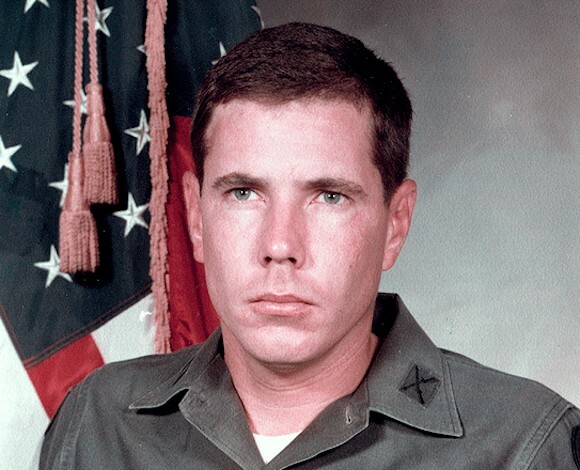 In My Lai and afterwards, he trusted his own sense of right and wrong. He faced down the entire military and political might of the US government because he knew it was the right thing to do. A movement is defined by its heroes. The Resistance can find better heroes than the ones some of its members have chosen – and it should. It can start with Hugh Thompson, Jr.